What’s New in ArcPy at ArcGIS 10.1 (and 10.2)? Second winner in Competition to win ArcGIS for Desktop Training Day has been drawn! Earlier today, Barb Angus, the Queensland Regional Office Manager of the Surveying and Spatial Sciences Institute (SSSI), kindly agreed to draw the second (and last) winner in our Competition to win PolyGeo Training in ArcGIS for Desktop. The competition closed on 15 January 2014 and attracted entrants from all states (except South Australia and the Northern Territory) as well as Canada, Finland and India. The winning number was 23, which made George Rowlinson of LandPartners the winner. George’s prize is an ArcGIS for Desktop Training Day valued at $599 (including GST). Many thanks to all of those who entered the competition but did not come away with a prize – better luck next year! First winner in Competition to win ArcGIS for Desktop Training Day has been drawn! Yesterday, Jack de Lange, the Special Projects Officer of the Spatial Industries Business Association (SIBA), kindly agreed to draw the first winner in our Competition to win PolyGeo Training in ArcGIS for Desktop. The competition continues through December until 15 January 2014 with up to 9 more draws so, if you have not already, please enter ASAP! You just need to check four multiple choice boxes. The winning number was 9, which made Stephen Trent of Queensland’s Department of Environment and Heritage Protection (EHP) the winner. 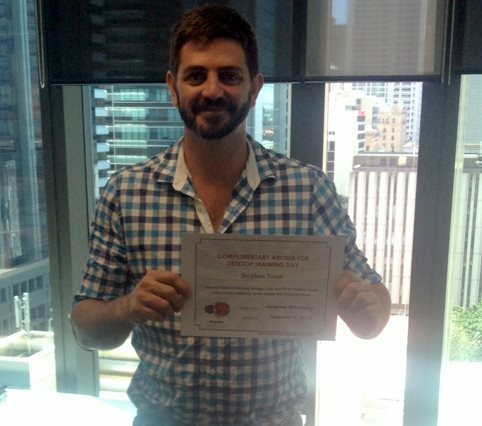 Stephen’s photograph appears below shortly after receiving his voucher for an ArcGIS for Desktop Training Day valued at $590 (including GST). This year I will celebrate International GIS Day on Wednesday, 20 November 2013 at a daylong function organised by GIS People in Brisbane. While there I hope to encourage involvement with the GIS Stack Exchange, GeoRabble, the Surveying and Spatial Sciences Institute (SSSI) and the Brisbane Geospatial Network (BGN). I will also have my laptop with me and am happy to demonstrate a Story Map developed using ArcGIS for Desktop about William Slight who was an early Australian map engraver (and my great-great-great-grandfather). Naturally, I will also be suggesting that people enter the Competition to win PolyGeo Training in ArcGIS for Desktop! PolyGeo is offering the chance to win ArcGIS for Desktop Training Days! Early responders have more chance of winning! To be eligible for the draws between now and 15 January 2014, you simply need to tick four multiple choice boxes (plus include your name, organisation and email/phone) in PolyGeo‘s ArcGIS for Desktop Training Survey 2013. To reward early responders, the first draw for a Training Day (valued at $590) will occur when at least one response has been received from 20 Australian organisations. Those who do not win remain in subsequent draws. After that, for every additional 20 respondent organisations from Australia, another Training Day will be drawn. Training Day can be used on any course which is confirmed to run – we will do our best, but cannot guarantee, to accommodate your first choice of course/workshops and locations. Before leaving this countdown I will mention just one of the very many worthy ArcGIS Ideas that “missed my cut” which is 64 bit ArcGIS Desktop and currently “Under Consideration”. With that I will handover to the Plenary presenters to hopefully fulfil more than just one or two of my wishlist. This has already been requested by 1,238 people but to ensure it gets over the line sooner rather than later, if you have not already voted for it, be sure to add your voice to the ArcGIS Idea link above. ModelBuilder is not the most fashionable part of the Geoprocessing Framework since the advent of ArcPy but it still plays a key role for those who want to visualise their processes in a way that code alone cannot. Coupled with enhancement of the much maligned background geoprocessing progress bar (which seems to be Under Consideration for improvement) is enough for me to rank it #3. PS I almost included “Save As” in Model Builder here but am pleased to note that this was implemented in 10.1 – thanks Esri! At #4 are enhancements that I would like to see related to PDF support. Most of these relate to “maps on demand” type Geoprocessing Services that I sometimes develop. If you are keen to see any/all of the above implemented, then I encourage you to follow the links to find corresponding ArcGIS Ideas awaiting your vote.